I’ve had a couple new designs (and an article) published since I last checked in! An article on Thrumming and a pattern for a thrummed cowl and hand muff (Arctic Cowl and Muff) was published in the newest Cast On. This is the first all-digital Cast On issue – and it is a great issue! Chock full of great patterns and articles. I had a lot of fun designing this set. 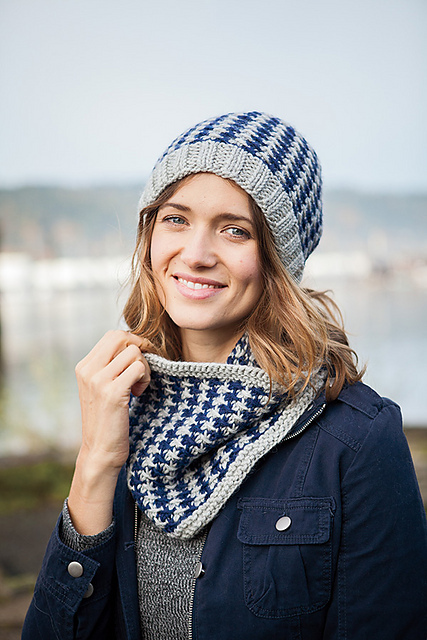 It’s knit in a bulky yarn, and the stitch pattern is a fun one! I really hope to do better about more regularly posting here this year! I’ve got a big pattern in the works due to come out in the summer that I’m very excited about (a lace shawl!) and more lace for the summer issue of Cast On, and some socks in the works, plus some teaching opportunities I’m working on as well! It’s all set to be a fantastic 2017! Previous postIndie Designer Gift A Long (GAL) 2016! Next postI got a new Stitch Dictionary!